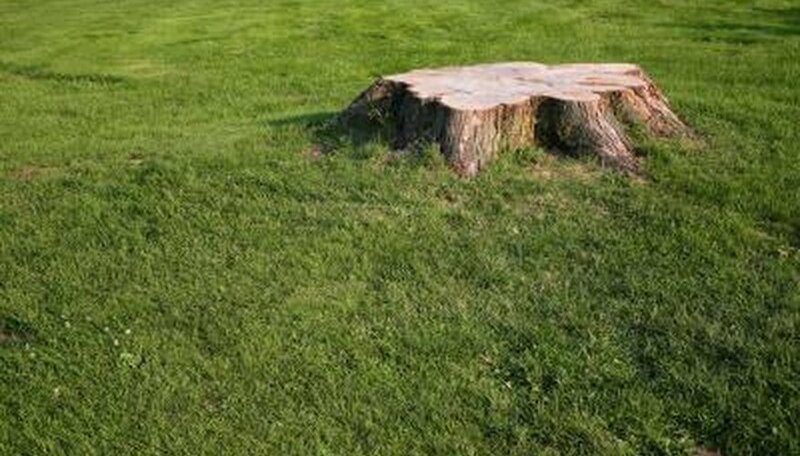 Removing that old tree stump in your yard doesn't require harsh chemical treatments to kill the roots. Whether you have a yard full of stumps to remove, or you've recently cut down a sapling and need a quick fix to remove the stump, you can take care of the project yourself with a few afternoons and some rented tools. Consult a professional before attempting to use a stump grinder yourself. Renting a stump grinder is costly if you're only removing a stump or two from your yard, according to Popular Mechanics. But if you have a yard full of stumps that need to be removed, it's a more cost-efficient option than hiring a professional to grind the stumps. Before using a stump grinder, remove all the rocks from the ground surrounding the stump, and use a chainsaw to cut as much of the stump off as possible. Place the grinder approximately 3 inches above the stump, and place the grinder wheel at the front edge of the stump. Bring the grinder down until it is about 3 inches inside the stump, then move the grinder wheel from one side to the other to remove the ground wood. Repeat the process until the stump is gone. For small saplings and trees with shallow roots, it is possible to remove the entire stump by hand with a shovel, a root saw and an axe. Dig the dirt around the stump with a shovel to expose the roots. Cut the roots as you proceed with a root saw, and retrieve the root pieces from the ground with the axe. Hack the stump pieces into small pieces, and use them for compost. Starting a contained fire on top of the stump is an effective way to burn away the stump and remove the roots, but check to make sure it's legal in your area. In some locations, homeowners can only have fires in their yard during certain times of year -- in other locations, starting a contained fire at any time is illegal. Place pieces of scrap wood and sticks on top of the stump and continue burning the fire until the stump is gone, recommends This Old House. This process is likely to take several hours, depending on the size of the stump. A backhoe is a safe and non-toxic way to remove stumps from your yard, but because the machine is so large, it could create messy tire tracks in your yard. If you have a large or wooded yard, a backhoe is a quick and effective solution. A professional attaches the backhoe to the stump with a pallet fork attachment, and it lifts the stump completely out of the ground. The remnants of the stump are either removed from the yard and disposed of, or buried.